Can You Reheat Bacon? | Can You Reheat? Q: My husband loves to make breakfast in the mornings; the only problem is that when he does, he always makes enough to feed an army. He has enough leftover bacon to feedus for a few weeks it seems. Is there a way to reheat bacon, or should I just make something else with it? A: Reheating bacon is tricky territory. When you are tryingto reheat it, you will run a very good possibility of drying it out, or making very crispy bites. While that may not be an issue for some, the best way to reheat, bacon is in the skillet. Bacon run a fine line of being perfectly done, and overdone. Since you have already cooked it, a lot of grease has already left the piece. Therefore, if you saved the grease from the cooking, you can use a teaspoon to oil the pan. If you did not, no need to worry, the process is the same. Simply add the bacon to the skillet, and heat it on low, covered. This is the best way to ensure the pieces are not dried out. This should only take about three minutes to heat through. 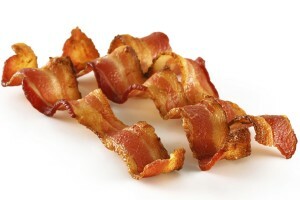 Bacon is a great breakfast dish, dinner or treat for those who enjoy it. While most people do enjoy having it fresh, sometimes time makes us reheat it. Using these methods, you can have a great bacon for another day, without all the hassle of being splattered with grease.